Mother’s Day is tomorrow. Looking for a quick, fun, no-fuss activity to do with the kids or maybe something you’d like to make on your own as a gift? How about an all-natural spa salt bath? It’s a great way to show mom you care and a perfect way to encourage her to treat herself! At the minimum, all you need is some salt and herbs. As an option, you can also add in essential oils, which are readily available at many stores. So this is a project that you can literally do last minute and with minimal cash. The base of any great bath salt blend is — you guessed it — salt! You can use most any salt, but I would skip the finely ground and refined iodized salt often used for cooking. Instead, go ahead and get creative by using different kinds of salts full of minerals and therapeutic benefits. Himalayan pink salt, Dead Sea salt, Epsom salt, Hawaiian red salt, etc. all are good choices and available at most grocery stores in the cooking and/or personal care sections. I often use Dead Sea salt due to its wide range of minerals and the fact it’s readily available. Plus, a lot of amazing research has been done showing how beneficial it is as I discuss in this post. But if price is a factor, sticking with Epsom salts is a good choice as a huge package of it costs just a few dollars at any drug store. Plus, Epsom salts are very relaxing and great for soothing sore muscles, so they’re really therapeutic. To the Epsom salts, you can then add in some more expensive, colorful salt like Himalayan pink salt or some other specialty salt (see how colorful the 7 Seas selection is below?) for a little extra flare and color if you desire. You can make several containers of spa quality bath salts on the cheap this way! Once you’ve good a good salt base, your next task is to decide on some herbs to really make your bath blends aesthetically pleasing. Herbs also release natural essential oils in the bath water, just as they would in a cup of hot tea, so they’re an aromatic addition to your bath salts and they have therapeutic benefits, too. For example, lavender and chamomile are great for the skin and make a very pleasing relaxing bath blend; whereas, peppermint makes a more energizing and naturally detoxifying bath blend. If you can’t find dried herbs in the cooking section at your local store, one of my favorite tricks is to buy an herbal tea containing the herbs I’m after. You can easily find chamomile or lavender tea by itself and sometimes “relaxing” teas that have a blend of flowers, such as chamomile and lavender. For example, Yogi has a lavender with honey blend (honey is good for the skin as I explain in this post, so don’t by shy about trying it!) and Traditional Medicinals has a chamomile with lavender blend. Rose teas can also be found but are a little trickier to come by (they’re usually available in stores with more of a gourmet tea selection available). By far some of the easier ones to find are simply chamomile and peppermint tea. By the way, for some extra anti-aging benefits, don’t be afraid to also add in a little bit of white or green tea. It’s fabulous for the skin due to its high antioxidant content. Plus, if you get one with a beautiful fragrance, such as jasmine green tea, it will infuse your bath salts with the scent and there may be no need to add in essential oils at all. How much should you add? It’s up to you. I simply rip open a few tea bags to eyeball the amount of dried herbs I think I need and then mix them in to see how they look. On average, I use maybe about 1 – 2 teaspoons per cup of salt. But, don’t worry, you can’t really add in too much. After all, there are spa baths out there that are purely made of herbs with no salt added. Might be a little messy, but nevertheless, still therapeutic. Note: When adding fresh herbs or citrus peels, I make them large enough, so that they are easy to retrieve from the tub when the bath water is drained. Now this is my favorite step. I love tinkering with essential oils to create blends that suit my mood. Don’t get essential oils confused with fragrance oils. Essential oils are different in that they are all natural oils derived from plants; whereas, fragrance oils are partially or completely synthetic. As you never know what chemicals were used to create a synthetic fragrance blend (it could be up to hundreds! ), I recommend steering clear of them due to their many associated negative health effects. There is more to essential oils than just how they smell, they also have true therapeutic benefits. They affect you on a physical, spiritual, and emotional level. And they’re great to use for so many other things, such as other spa treatments and homemade green cleaning products, that I recommend investing in a good quality set. I usually use about 9 – 12 drops of essential oil per cup of bath salt. If I’m using a really gentle oil, such as lavender, I might even use a tad more. Essential oils can easily be purchased at most natural products grocery stores like Whole Foods Market in the bath and body aisle and also in some stores like GNC. Of course, shopping for them online from sources such as Amazon is easy to do as well. That way you might even be able to get some specialty oils or organic oils that your local store may not offer. Tip: One of my favorite ways to decide which oils to combine, is to simply take the tops off the essential oil bottles I’m considering, then hold them together and wave them back and forth about 6-12 inches below my nose to get an idea of how they would smell together. This allows you to be creative and mix together oils that you may not normally, such as lemon and lavender. No need for fancy packaging when it comes to bath salts, but something pretty does make it more special. Recycling clear mason, salad dressing, and condiment jars are great options as they show off your bath salts. I wouldn’t use plastic unless it’s PET plastic like the jar shown below. Otherwise, if you use essential oils, they can break down regular plastic. If it’s a gift, don’t forget to make a pretty label and/or gift tag (try some twine with a tag) for your jar. Then put it in an eco-friendly gift bag. Or, simply wrap it with a scrap of burlap or fabric, then tie it with twine or ribbon. That’s sure to lend a nice, chic natural vibe to it. Note: Photographs of products, which are linked to my affiliate account on Amazon, are used for illustrative purposes only and do not imply an endorsement of the product or company unless I explicitly state so. Copyright © Karen Peltier and Well Gal, 2012-2016. All rights reserved. Spa Bath Salts Photo © Karen Peltier. I use eucalyptus and peppermint EO and when putting in the water it does not smell. .. what can I do? Are you adding them to a salt or carrier oil, such as almond oil? If so, that helps it disperse in the water a little better. Also, just a note, since eucalyptus and peppermint are pretty strong oils, I wouldn’t use more than 12 drops total in one bath. This is a great idea for a gift that my kids would love to put together for my wife. Too bad I didn’t read this post before this last Mother’s day. There is always next year! I have made my own soaps and lotions in the past but never bath salts. Your ideas are great and now I can’t wait to create my own for gifts and personal use! I thought all oils were the same? Thanks for pointing that out. My thoughts would be using this for all the wonderful women in my life. They, all enjoy a great soaking. That is what they purchase different items to float and candles to set the tone in the bath. Now, I can gift a collection of things that work! Thanks for always giving us great ideas and healthy choices. Glad you had a chance to discover that not all essential oils are the same. They vary widely in their chemical constituent concentrations and therefore, in their therapeutic benefits as well. First of all Thanks for this nice post. You have mentioned a cool idea of DIY bath salts. 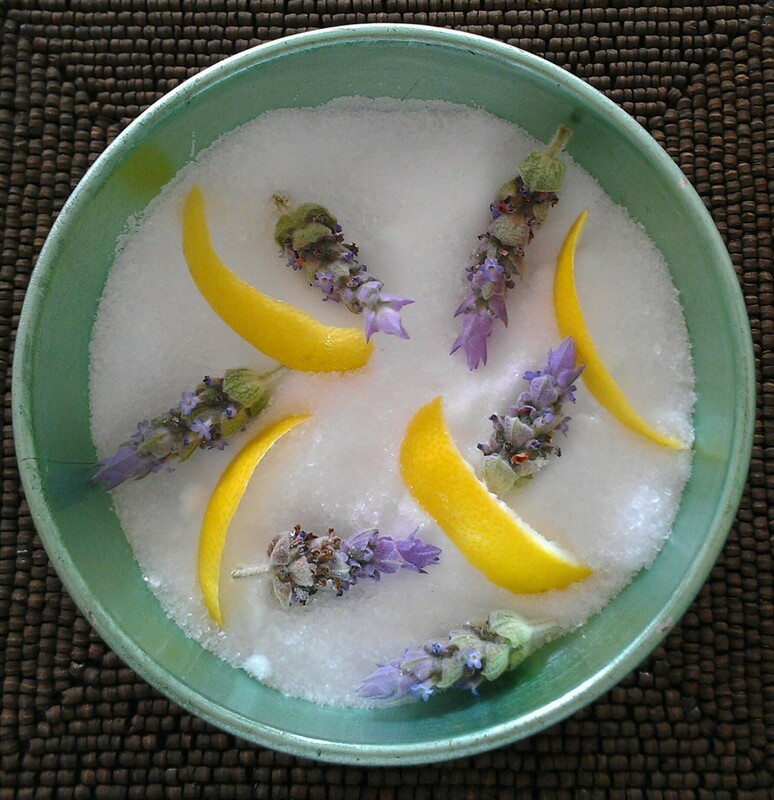 These DIY natural spa bath salts really do make great Christmas or Hanukkah presents. When making them around the holidays, I love using essential oils with scents reminiscent of the season, such as peppermint, grapefruit, ginger, vanilla, and orange. Awesome! Have fun whipping up some DIY bath salts. Let me know if you discover a favorite combo. You know, I felt the same way, too, for the longest time. It wasn’t until I started studying holistic health and learning about the therapeutic benefits of spa therapies, including balneotherapy (i.e., bath therapy), that I started to realize that some of these things are a true part of health and wellness. They truly help heal us. This was a lot different from the idea I had growing up that they were a “treat” and something maybe only done at a spa (which I had no where near me growing up). They weren’t at all familiar to me. Now, however, I try to sneak these little spa treatments in at home from time to time as I know how great they can be! Nah. Just use some homemade germ-busting creamy scrub cleanser and vinegar-water spray to get your bathtub spotless and you’re good to go! Ready for baths galore! And thank you for clarifying the difference between “essential oils” and “fragrant oils!” Because I really had no clue and just sort of thought they were basically the same!LOL! And the entire process seems like it would a really fun project to do! Mark recently posted…So How Does A Graphic Designer With No Experience But A Fancy Degree Really Get Started? Thanks! I’m hoping I’ve inspired you. It really is fun and very rewarding to create your own spa bath salts, especially if you get a thrill out of making things.